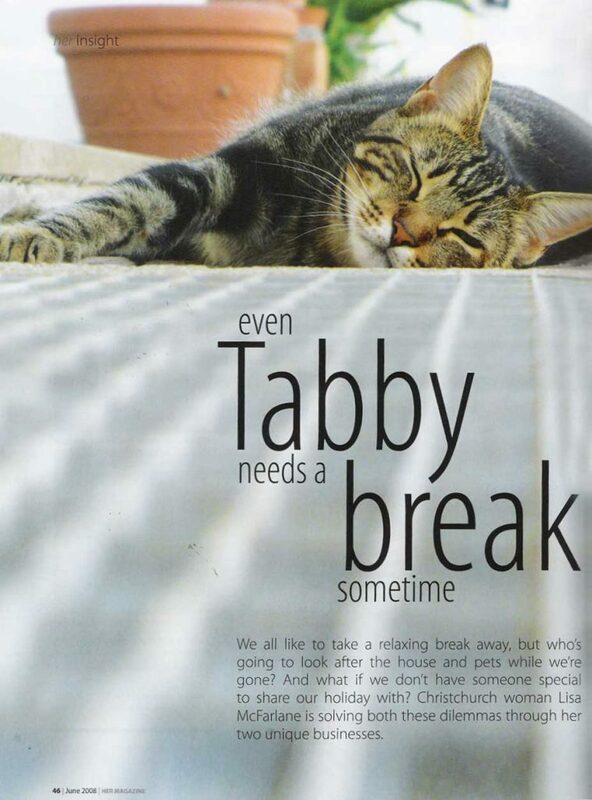 The biggest concern for most people when they go away on holiday is, who is going to look after the pets? People have been known not to take a holiday for up to 20 years for the simple reason that they know they will have no peace of mind leaving the animals behind, being tended by unknown persons. Pet-lovers need worry no longer, for Town and Country Homesit can find just the right people to look after your animals, either in your city home or out on your rural property. “People adore their animals, to the extent of having electric blankets for their cat. They are then so relieved and grateful when they find someone to tend their pets while they’re away,” says Lisa McFarlane, managing director of Town and Country Homesit. Leaving your pets at home means that they can stay in their familiar environment instead of at a boarding establishment or with relations, and they can keep their normal routines. The sitters are guaranteed to be experienced with animals and will provide the necessary care for whatever situation arises, whether it be walking dogs or administering medication to pets. As well as farm animals, the sitters have looked after creatures ranging from turtles and goldfish to llamas and pet magpies. Of course, the sitters will be doing more that just looking after the pets. You can rest assured they will maintain the presence of someone within your home, thus discouraging potential intruders. Other household chores, like mail-collection, watering plants, lawn-mowing and forwarding of messages will also be taken care of by the sitters; and Town and Country Homesit can arrange other services, such as gardening, pet-grooming, and window and carpet-cleaning. Home-sitters will also advise Lisa of any necessary property maintenance or repair, such as burst or leaking pipes, weather damage or electrical problems. Lisa saw the need for home­sitter s in and around Christchurch after she returned 5 ½ years ago from London, where she had been doing graduate recruitment for investment banks. Having grown up on a farm, and adoring animals, Lisa saw the opportunity to combine these interests with her recruitment experience. In this case, recruiting suitable people to look after homes and pets. “As there was no service in existence in Christchurch, it seemed like the need for such an organisation was long overdue,” Lisa says. With the help of her mother, Helen, their first home sitter was placed in May 2000, and things have not looked back. In fact, things have been going so successfully for Lisa, now aged 30, that she was one of 15 in New Zealand recently chosen by the Ministry of Youth Development as an example of a successful young entrepreneur for business school studies to be used in universities and secondary schools. Town and Country Homesit specialises in city properties and rural lifestyle blocks, and also services larger farms if suitable sitters are available. The process of finding a suitable housesitter begins with Lisa or Helen coming to your home to assess what sort of person would be best suited to you and your animals. It is important that you, the sitters and, of course, the pets (if applicable) are all compatible, so that you can feel confident your home and pets are in capable hands. The sitters, who are usually acquired through word of mouth, are all aged over 30. They are thoroughly screened, police ­checked and reference-checked. Their situations vary from having just sold a property and waiting to build, to having recently returned from overseas. Clients pay a one-off registration fee plus a daily animal-minding fee starting at $15, which varies depending on whether it’s tending to one small dog, for instance, or a herd of goats. Costs are negotiable for long-term cases. One of the great things about living on a rural block is having room to extend your four-legged or many-feathered family. In no time, you find the family dog or cat has been joined by some sheep (to keep down the grass), a few goats (to keep down the weeds), a couple of cows (fresh milk), a pair of ponies (well, there’s room! ), a clutch of chooks (those yummy yellow yolks) and a few rabbits (the kids insisted). All good fun – until you want to take a holiday. By now, you’ve also discovered your fence-fixing skills or sheep shearing techniques leave a lot to be desired and you’re worried about if, when and how various members of your growing menagerie need drenching – or extra feed given the dry summer. Enter the minders – Helen McFarlane runs Christchurch-based Town and Country Homesit. It functions like an agency that has on its books a range of police referenced checked sitters who look after properties while their owners are away. “We’ve been operating around the Canterbury area for nearly two years now -dealing with town and rural properties. Previously the owner of a florist business, Helen is in a farm partnership with her husband and breeds border collies (she’s also bred Birman cats) so is well aware of animal needs. She works in with daughter Lisa, whose offshore experience in human resource management comes in handy when matching property owners with suitable sitters. 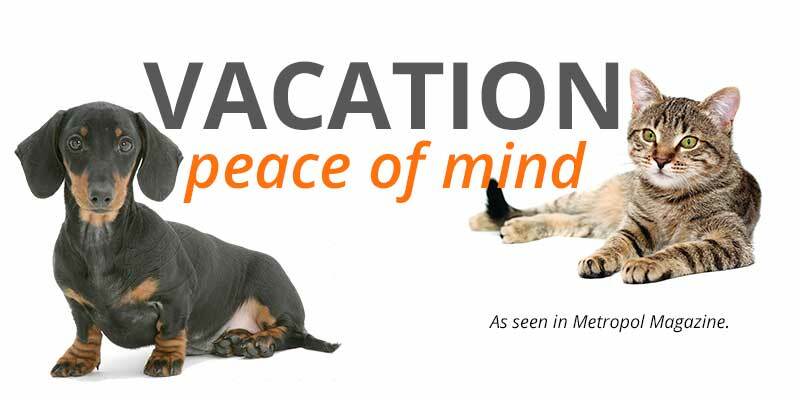 “We do have clients who use us solely for security while they’re away, but most of our clients have at least one pet. We’ve had everything from guinea pigs to alpacas the only one we had to decline was someone asking about a couple of rats.” Sitters basically take on whatever needs to be done on a property – often going beyond the call of duty. Advertising is largely word of mouth, with referrals coming through such sources as vet&, insurance companies, the SPCA, dog breeders, Neighbourhood watch and crime prevention groups, as well as hospitals and doctors. Helen also has a store of stories to tell – the boxer pup who thought it could still fit through the cat door, demolished the lot and then roared around the terrace the door still attached around its tummy inadvertently destroying all the pot plants. Ever wanted to take that dream holiday but couldn’t due to the responsibilities of your property or household pets? GreenFields shareholder Helen McFarlane and her daughter Lisa realised there was a real gap in the market for experienced house sitters to homesit lifestyle properties and have set up Town & Country Homesit Ltd, providing an extensive live in home, property care and pet minding service for both city and rural properties in the Canterbury area. Town & Country Homesit Ltd can match clients with experienced sitters for short or long term assignments sometimes even at short notice. The service also includes exercising dogs if necessary and any medication of pets, collection of mail, forwarding of messages and plant watering right down to lawn mowing and gardening which may also be arranged. Helen says a lot of work goes into ensuring her employees are of an exceptional standard and can cope with a diverse range of tasks. The sitters maintain an appearance in the owners absence discouraging potential intruders and keeping pets in a secure and familiar environment and farm animals fed, watered and cared for. “We meet clients at their home, discuss requirements and then they are matched with a suitable sitter whom they meet with before the sit commences. We have Legal Terms & Conditions that the sitters abide by and to safeguard the owners,” says Helen. The McFarlane’s have an extensive rural background. Helen and her husband Bruce farmed in partnership for 18 years in South Canterbury and have been farming in Canterbury for the past 13 years. Up until recently Helen owned a country Garden Centre/Florist business, she has bred Birman cats in the past and now breeds Border Collies. Daughter Lisa was ‘farm raised’ and has previously been in Recruitment and HR for investment banks in London so is very experienced with the recruitment of sitters and of matching sitters to clients and their needs. Tending turtles, walking dogs , feeding goldfish and playing ranch-hand to a herd of llamas is a long way from an investment banking career in London – but for Christchurch’s Lisa McFarlane running a firm and house-sitting service has turned up as many daily challenges as stock watching of the financial variety. 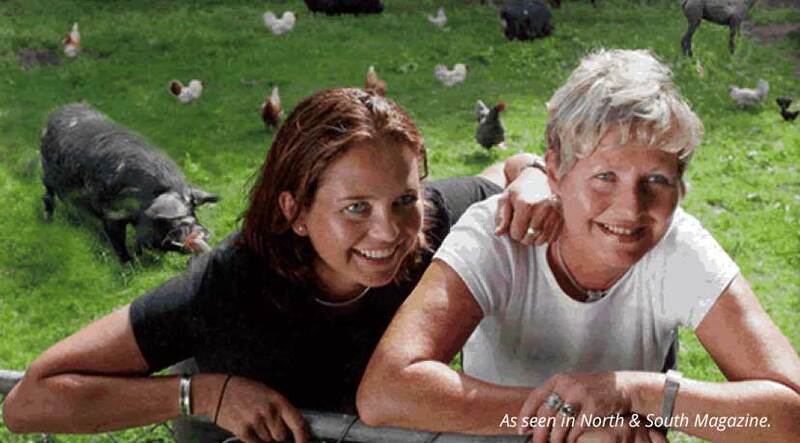 As owner of Town & Country Homesit, Lisa has learned the fine art of matchmaking: partnering suitable, police-checked housesitters and clients who wan to leave their animals in care in their own home – or on the farm – while they go off to enjoy what may be their first holiday in decades. Lisa, 27, identified a market niche for an agency that could provide experienced ‘sitters’ for farms and lifestyle blocks and, on her return from London two years ago, decided it was ‘worth a go’. Her mother Helen helps with the business, taking care of advertising and client calls. As a farm owner herself, she knows how hard it can be to get away for a holiday. Potential sitters have to pass a police check and Lisa’s own reference-sifting system before they’re assigned to a job. Even then, says Lisa, it’s sometimes the animals that decide: “l’ve had a situation where the sitter and clients were ideal for each other, but the sitter felt ill at ease with the dog. “The company’s sitters include retired farmers, nurses, teachers, mature students and people between homes or relationships. Most are between 45 and 50 and Lisa says it is becoming a popular part time ‘occupation’ for retired couples. She says both client and sitter have to abide by a set of legal terms and conditions and sitters are only paid if they carry out extra farm or garden work. Clients pay a $50 to $75 registration fee plus a daily animal minding fee, which varies depending on whether it’s tending to one small dog, for instance, or a herd of goats. While minding rural blocks has its own set of wayward possibilities, it seems plenty can go awry in the city. Lisa says they’ve had a number of incidents they can now laugh about – like the sitter who was greatly surprised when the clients toilet came away from the wall during a private moment; or the small dog that ate it’s owner’s false eyelashes and shredded her knickers; or the boxer pup which thought it could still fit through the cat door, demolished the lot and ran around the garden with the cat flap stuck around its middle. The same dog also ate its owner’s university robes. To launch a new business you need passion, drive and lots of self-belief. Minding My Own Business asks entrepreneurs what they did right and wrong, so that others can learn from their lessons. Lisa McFarlane runs a professional homesitting, pet-minding, and personal organizer service for city and rural properties in the Canterbury area. Lived in London for 41/2 years doing investment banking graduate recruitment for Credit Suisse and Goldman Sachs. Why did you want to change? London had lost its charm and I missed home – and especially working with animals. Also, I have always wanted to be in control of my own business, because I’m not the best person to be told what to do. Having grown up on a farm, and adoring animals, I wanted to use my love for fluffy creatures with my recruitment experience, and this seemed the logical thing to do. As there was no service in existence in Christchurch, it seemed like the need for such an organization was long overdue. What made you think there was a market? Talking to family friends made me realise that many people, especially farmers and small lifestyle block owners, found it increasingly difficult to get away. Coupled with the growing incidence of robberies and property invasion, this all means people are reluctant to leave their homes unattended. After three years of organising homesits, it has also become clear how much the small things in life are appreciated – a freshly mown lawn, milk in the fridge, a happy walked dog and lasagne in the oven ready for the family’s return. what could be nicer after a long journey? Deciding that if I were going to do it, I would do it properly – professionally or not at all. The sitters would be police-checked and reference-checked, and if I didn’t have the right person then I would do it myself. It’s so important for all parties to be happy or how can one go on holiday and enjoy? The sitters are my business, and without their constant loyalty and respect they have for each individual home and animal it just wouldn’t work. What is the dumbest thing you have done? Set up a price structure based on what animal boarding establishments were charging when in fact we’re offering a completely different and much more comprehensive series. What is especially hard is having nothing much in the South Island to compare this with. Not having someone else to share the load when the pressure comes on. Sometimes it’s nice to be able to walk away and leave it with the boss to deal with, but now – there have been sleepless nights. What is the one piece of advice you wish somebody had given you? Make user you have the motivation inside you to do this. There are times initially when I thought I didn’t have the guts and determination to run my own business and receiving phone calls at all hours of the day and night can sometimes be frustrating. But at the end of the day, the positive feedback that my clients give me about the service makes it all worth while. It’s what motivates me to keep going.